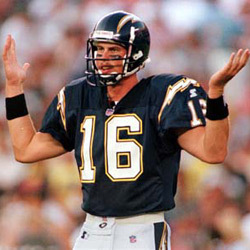 Ryan Leaf was born in Great Falls, Montana on May 15, 1976. He is a former American football quarterback, jersey number 16, who played for the San Diego Chargers, Tampa Bay Buccaneers, Dallas Cowboys and Seattle Seahawks between 1998 and 2002. As of 2008, he is the quarterback coach and head coach of the golf team for West Texas A&M University. He led C. M. Russell High School to the 1992 Montana state title. After high school, Leaf played college football at Washington State University, playing in 32 games for the Cougars and starting 24 of them. He averaged 330.6 yards passing per game in his junior year and threw for a conference record of 33 touchdowns. Leaf had a successful college career at Washington State University, where he was a finalist for the Heisman Trophy his junior year. 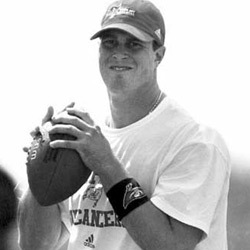 He was selected as the second overall pick in the 1998 NFL Draft after Peyton Manning of the University of Tennessee, after which many scouts predicted that Leaf would have a successful career in the league. Leaf was a finalist for the Heisman Trophy, given annually to the ‘most outstanding’ player in American college football, as voted by media figures and former players. He finished third in the voting, behind winner Charles Woodson of Michigan and fellow quarterback Peyton Manning of Tennessee. He was a first-team All-American, and had the second-best national passer rating. Following the Rose Bowl, Leaf announced that he would skip his senior year at Washington State and turn professional. San Diego's high hopes for Leaf were soon crushed, as his rookie season was marked by bad performances. However, Leaf did well in the preseason and won his first two games as a rookie, becoming the first quarterback to do so since John Elway in the 1983 season. Leaf missed his entire second season because of a shoulder injury uncovered by a preseason physical. Leaf also allegedly lied about a hand injury to get out of practice so he could play golf instead. The Chargers wanted to shorten the length of his contract, but despite the unrest between Leaf and the Chargers front office, Leaf would remain with the Chargers into the 2000 season. After being released by San Diego, Leaf was claimed by the Tampa Bay Buccaneers, who were intrigued by his physical talent and planned to develop his abilities more slowly by having him watch and learn. The club asked Leaf to accept a lower salary. He refused, and the club released him just five days before the start of the 2001 season. Leaf attempted a comeback with the Dallas Cowboys, who signed him a few weeks after the Buccaneers released him. Leaf was signed days later to a one-year contract by the Seattle Seahawks who planned to let him develop slowly so he could heal from his injuries. The quarterback attended the team's spring minicamps and seemed upbeat about his new team. However, Leaf retired at age 26, just before the start of the Seahawks' 2002 training camp, later citing his injuries. During his brief career in the NFL, Leaf appeared in 25 games and made 21 starts. He completed 315 of 655 passes for 3,666 yards, with 14 touchdowns and 36 interceptions. Despite his athleticism, his time as a professional was short and marked by injuries, bad media relations, and poor performance. A movie about his short career is being made. He is widely regarded as having crippled multiple sports franchises for years in the result of his combined massive contracts and overall performance failure, and is generally considered to be one of the biggest flops in NFL history. He graduated from Washington State University in 2005 with a bachelor's degree in arts and humanities in May 2005. His ultimate dream is to become a head coach at a college in his home state, Montana. He says he has no aspirations to coach at the next level. “I definitely don't want to do anything associated with the NFL,” he said. ESPN listed Leaf first on both their list of the 50 biggest NFL draft busts and their list of the “25 Biggest Sports Flops” between 1979 and 2004. MSNBC commentator Michael Ventre went so far as to call Leaf “the biggest bust in the history of professional sports”. Each year, some sports writers speculate on which drafted player will be the ‘next Ryan Leaf’, the next big college superstar to flop in the pros. However, Leaf is listed in the Sports Illustrated article “50 Greatest Montana Sports Figures”, from December 1999.